That’s when Nelson knew… he’d messed up. But a poisoned dog isn’t a laughing matter! Anybody who has loved a dog understands why the dog health category is one of our busiest. Whether you’re talking about a chihuahua with a spirit 10 times its size, a hapless puppy that can’t pay attention to its surroundings, or a dog with an insatiable love of chocolate, they just can’t seem to stop getting themselves into trouble. And with spring lawncare season beginning, there’s lots of trouble for dogs to get into. At JustAnswer, the increased traffic to questions about dogs getting into lawn chemicals is a grim reminder of the importance of recognizing dog poisoning symptoms and how to respond in an emergency. 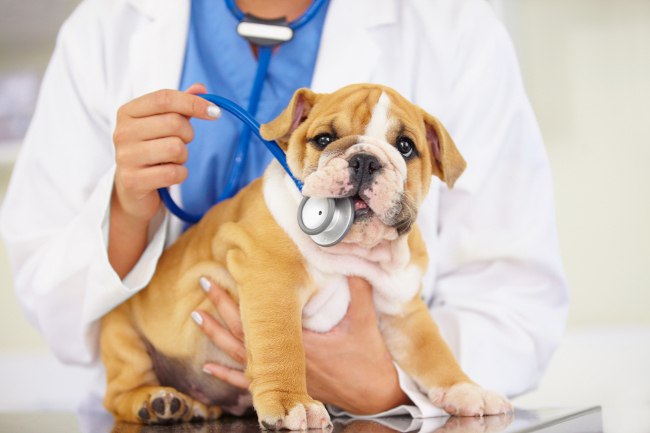 Although the overall number of visitors to the dog health category declined a little during the month of May, one particular question gained enough additional traffic to jump from third place to the top of the list. While this is wonderful for the customer in this example, though, what if the dog had gotten into something worse? Everyone knows that dogs eat the strangest things, but there are some items that you should keep a close eye out for, like antifreeze, poisons for rats, mice, slugs or snails, or prescription medications. When a dog is poisoned, the symptoms can vary a great deal based on what the dog got into and how big of a dosage was consumed. Some can build over time with continued doses, while others can be immediately life threatening. Drop in appetite: Changes in diet are often the first sign of a problem with a dog, particularly if it lasts for several meals in a row. Excessive drooling: This usually indicates nausea, especially if there is a lot of drool. If it turns to foam, it’s a bad sign! Throwing up: If your dog is showing some of these other symptoms and starts to throw up, it’s time to get serious. Collect a sample of the vomit so the vet can test for toxins. Diarrhea: Just like the vomiting, this is another indication that something is wrong. Your vet will want a stool sample to test as well. Rashes or irritation: If the poison wasn’t eaten but gotten through direct contact, there may be signs of its impact on the dog’s skin. If you find an itchy rash or blisters filled with puss, these may be signs of contact poisoning. Many of these dog poisoning symptoms can be mistaken for other issues, but if you start to see a few of them, it’s not a bad idea to have your vet look at your dog. Increasing tiredness: This can be the result of fighting the poison, or it can be a sign that it is attacking the heart muscle. Either way it’s a bad sign when it lasts more than a day, or if it’s accompanied by vomiting or diarrhea. Clumsiness: This means that the poison is starting to impact the dog’s brain and affect motor control. If your dog starts bumping into things, falling over or seems dizzy, something bad is happening. Shaking or having seizures: This is further sign of a toxic material attacking the brain. Loss of bowel or bladder control: This one explains itself. Trouble breathing: If the poison is affecting the heart, it can cause a buildup of fluid in the lungs. This will result in labored breaths and a heaving chest. Unconsciousness or coma: If the dog falls asleep and can’t be woken up, it’s getting towards the last stages of poisoning, and death is certain if the dog goes untreated. If you’re seeing any of these dog poisoning symptoms, you need to get them to a vet as soon as possible, as death is likely if untreated. Awww, buddy! That’s what got you here in the first place! Identify the poison: If you can figure out what the dog got in to, it will make it easier for the vet to determine the right treatment. Contact your vet immediately: Follow whatever instructions you are given. Get your dog in for treatment: Do this right away, as every moment may be important. If you can’t get hold of your vet, contact ASPCA animal poison control or by phone at 1-888-426-4435. One of the biggest mistakes is to miss the chance to help your pet by waiting too long. If your pet is showing dog poisoning symptoms, every moment may count. It’s better to be safe than sorry. When you have an emergency veterinary situation and you need information like dog poisoning symptoms, the qualified Experts on JustAnswer can answer your dog health questions, and make sure you’re making the right decisions for your dog. What was the worst thing your dog ate? Tell us in the comments!